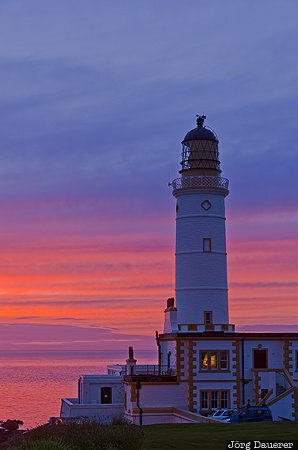 A colorful sunset behind Corsewall Lighthouse at Corsewall Point on the Rhins of Galloway peninsula in front of the Irish Sea. Corsewall Point is in Dumfries and Galloway in the south of Scotland, United Kingdom. This photo was taken in the evening of a cloudy day in June of 2013. This photo is part of the exhibition Lighthouses of Northern Europe (Oct'15). This photo was taken with a digital camera.